Our 2001 Jayco Qwest came with a Carefree of Colorado Awning that is several years old, but it good shape. First, the zipper was stuck and wouldn't slide to open. No worries. If you find yourself in this shape, spray with silicone spray. Presto. It worked like magic! The awning worked just fine except one of the vertical legs would not extend. No matter what we did, no go. A new awning pole is around $85 which is still less expensive than replacing the whole deal. And, I'm trying not to spend a million dollars on this one project. Finding the part for our exact awning was a little bit of work, but this company is amazing. I started emailing customer service to help me find the part we needed because I was not even sure of what model we had. After several emails back and forth, a sweet lady was able to help me determine exactly what I needed. When I was trying to fix the stuck pole, I could not figure out what in the world it was attached with. These little metal screws didn't look like any thing that I had seen. And before anyone judges me for not knowing what a rivet is, people are not born knowing this stuff. I called to order my new awning pole, and while on the phone I had another great helper explain what I needed to do to attach it! Can customer service get any better. Essentially, I need to drill out the existing rivets and replace the new pole with a rivet gun and the replacement part. Simple! I could do this. And this was a whole lot easier having been explained what those "screws" were and what tools I needed. Drilled out rivet hole. A little larger, but a washer can be placed there. However, I managed to make this work. Also, replacing an awning pole involves 2 rivets for the model that we had. This took about 30 minutes start to finish to replace. After removing the old rivet from the one connecting piece, I needed to reconnect the one pole (rivet one) and connect the footing piece (rivet two). Line up the rivet with the hole where the rivet is going to connect. Squeeze the rivet gun until it deploys the rivet into position. This does require some muscle. So now we have a like new awning to go with our like new pop up camper! I am thrilled! The new awning pole fits perfectly! Now that we have repaired the awning, we can get on with camping and putting up some fun lights to enjoy evenings outside. We have these awesome Klippy Clips to attach our lights to the awning. If you have rope lights, RV Designer has those too! RV Designer M122 Clear Klippy Klips for Rope Lights, 10 Pack I have a couple of packs tucked away in our storage for camping trips this year. If you are looking for other Camping Gadgets and Gear, check out my page with other ideas that will make camping more fun and easy! Also, don't miss a post about our adventures of a family of three. Follow along by subscribing to my blog. I'd love for you to join me on our journey. 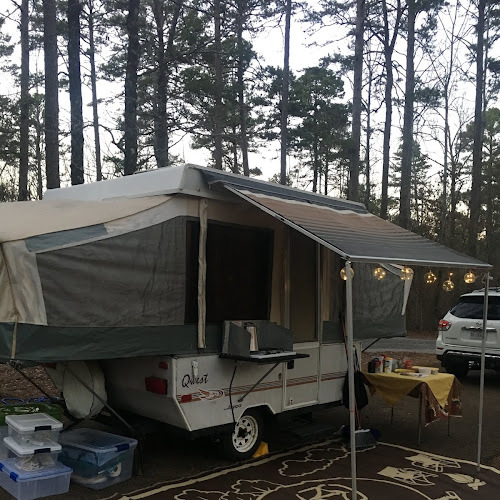 A few weeks ago, I wrote about making the pop up curtains for our camper. Hanging curtains requires planning, and it has to be planned for at the start of the project. Peggy Sue, our pop up camper, came equipped with ceiling tracks on the bunk end for hanging both valances and bunk end curtains. There was also a a wall track that allowed valances on the other walls. However, to hang the remaining privacy curtains, I had to get a little creative. First, I wanted our valances to wrap all the way around the camper. The valances were lined with blackout fabric and had track tape sewn on the back of all of them. I used two different kinds of track tape. For the wall mount valances, I used RV Designer Collection A115 72 Inch Glide Tape . This is a plastic strip with plastic attachments for the track. For the ceiling mount tracks, I used JR Products 81355 White 72" Sew-In Slide Rite Curtain Tape . Both of these constructed to fit snugly into the track system. They don't allow for gliding back and forth. So this is a stationary curtain that will stay in place when opening and closing the camper. At the end of each curtain, I sewed a little elastic loop. 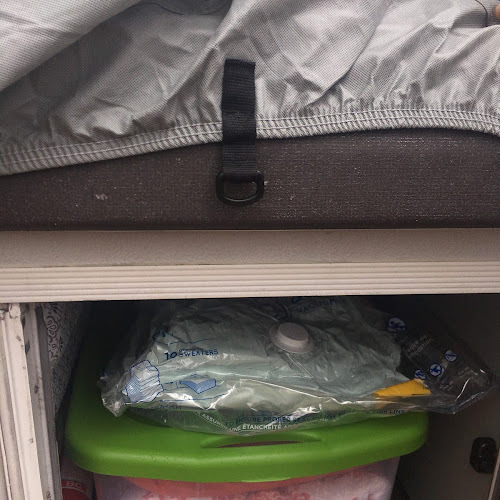 I used Command Mini Hooks to loop the elastic to and creating a wrap around affect closing in the interior of the pop up camper. If you have trouble getting the hooks to stay in place, then use gorilla glue. For the privacy curtains on the bunk ends, I wanted the curtains to be able to glide easily on the second ceiling track to open and shut as needed. Rather than use a tape, I used individual sew in glider pieces. JR Products 81275 Type C Elastic Sew-In Curtain Carrier were the pieces that I used. They were easy to use and glide effortlessly. They also stay put during opening and closing the pop up camper. The curtains that gave me the most trouble were the privacy curtains that hang along the sides of the camper over the seating and sink. I needed to create a way to hang a long curtain rod but didn't have a great way to attach it. And even a tension rod would not work. I started with hooks that had a metal end that I could strategically position along the side. However, these hooks were not wide enough to hold an actual rod. I could though clip a cafe rod to the hook and run the rod through it. To fully support the weight and secure these for popping the camper up and down, I attached the clips with Gorilla Glue. These curtains were simple panels that I attached cafe rings to it and ran them them the rod that I suspended from the hooks. If you are making curtains for a pop camper project, I recommend using the ceiling and wall track systems that are in your camper. They are a great way to create a stable curtain that will stay in place over time. For other privacy curtains, you may have to get creative with hanging options. This is just how I did ours. However, I would love to hear from you and how you hung up your curtains. Feel free to comment and share below. And have fun with your curtains and fabric choices you make. Your interior choices can really take a camper from drab to fab with ease. This has been my favorite part of our project. And I think we are going to enjoy the choices that we made in our remodel for a long time. Ever since I learned how to make biscuits a few years ago, I have been obsessed with new ways to make them different and fun. Sure a plain biscuit with butter and jelly is delicious, but there are so many things that you can do with this biscuit dough. I love using what I have on hand to make treats at home. It makes food much more interesting than just the same old thing over and over. This weekend, I had some heavy cream and little smokies in my fridge. This is the start of something great. This recipe is a twist on Natalie Dupree's 2 Ingredient Biscuits. These biscuits turns out perfect every time. You can thank me later. What you need is heavy cream and southern wheat self rising flour. By southern wheat, I mean White Lilly, Martha White, etc. The lower gluten is what allows this biscuit to work. Don't ask questions. Trust me on this one. Next, use your sausages to measure out your dough. Or you can just cut into twenty even pieces. Wrap each sausage in dough gently. If your hands are sticky, dust with flour. However, don't get heavy on the flour. You want a soft biscuit. Place with the seam side down into a greased 9 x 13 inch pan. It is okay if they don't wrap all the way around. Just cover as much as you can. Top with remaining 1/4 cup of heavy cream. Place into a preheated 425 degree oven. While these cook, mix together 2 to 3 tablespoons of honey with 1 1/2 tablespoons of butter. Heat slightly in the microwave for 20 seconds to combine thoroughly. When you remove the biscuits from the oven, brush with honey butter and let it sink in. You could stop here if you don't want to add the glaze, but the glaze is oh so good! Allow enough time for the glaze to seep into the biscuits. They won't be sticky. Just melt in your mouth good! Let sit for 5 minutes. Serve warm. Easy and small. Perfect for little hands and pairs well with fruit and eggs. I love a fun breakfast on the weekend, and what better way to do it than with little sausage biscuits. Do you have a biscuit recipe that you love? Feel free to share your biscuit successes and fails. We love to mix in fruit in the summer and glaze with a powdered sugar glaze. Play with this biscuit recipe. And, don't forget, this is perfect just as it is. If you want more recipes from Natalie Dupree, check out Mastering the Art of Southern Cooking. Also, check out her interview from the Splendid Table. She talks biscuits and gives more information about this formula for a perfect biscuit. Have a great week. Get out there and make some biscuits! Your family will love your for it! Oral hygiene is something that we started early with our little boy, formerly known as King Diaper. We started out like most parents with a little finger brush. NUK Infant/Baby Tooth and Gum Cleanser works great. This is also a great help for soothing teething babies gums. Hubs used to rub our guys gum's with teething gel using this little finger brush. And it worked wonders. Once we had a few teeth, we moved to a little training brush and continued to training paste. NUK Toddler Tooth and Gum Cleanser is easy to maneuver in small mouths. However, the dentist suggested last year that we consider an electric toothbrush. Customizable stickers for the brush. Android or Apple App for teaching children to brush properly. Timed brushing for the 2 minute recommended time. Pacing notifications during brushing to cover all areas of the mouth. Parent's can load the app to a phone or a tablet. We opted to load the app to a tablet. When it is time to brush your child's teeth, start the app from your device. The app can be customized with your child's name and/or picture. There is usually a brief set of instructions or information about oral health. Then, it it time to start the brush. The brush will connect with the app through your device's blue tooth connection. We just stand up his iPad on the edge of the sink for brushing. As your child brushes his/her teeth, the app will demonstrate what portion of the mouth should be brushed. After 30 seconds, a beep and vibration indicate it is time to move to the next portion of the mouth. This happens, three times during the tooth brushing session until the 2 minutes is up. Children are rewarded with little 'presents' in the app that allow the child to change the tooth brushing friend in the app's appearance or surroundings. Our little boy loves this feature! After he is done, he can click on his little rewards. So, why is this brush the one for us? Durability. After nearly a year, this brush is still in great shape. Long lasting charges. I rarely have to charge the brush. Changeable heads. Some electric brushes are disposable. I don't like this. And they cost more than this one over time. Supports good oral health. We have had no trouble with our child's teeth. I feel like it does a great job. Sonicare is a trusted brand in oral health. I have a Sonicare toothbrush for adults and love it too. It helps me to do a better job with brushing our child's teeth. It is easy to rush through brushing teeth to get on to the next task. Especially at the end of a long day or in a time crunch. This toothbrush's timing tool helps me to make sure we are devoting enough time to brushing teeth every single time. The Philips Sonicare for Kids has been the perfect toothbrush for us. If you have a little one at home and are about to transition your child to a new toothbrush, this may be the right choice for you too. I would recommend waiting until your child is at least 2 or really 3 before going this route. The vibrations may be too harsh for children younger than this. We started Prince Pullup with this toothbrush at 3, and he has done great. What toothbrush do you use for your kids? Feel free to share what has worked well for you at your home. This post provides Amazon Affiliate Links. If you have something that you would like to share with others, having a blog is pretty easy and fun. Blogs can be created to share crafts and DIY projects, mommy life and tips, recipes and more. If you have an idea for a blog, do it. It's a great creative outlet. I've been using Blogger for my site for a while. It is a project that I started a few years ago and have recently revived my efforts due to our Pop Up Camper Remodel project. 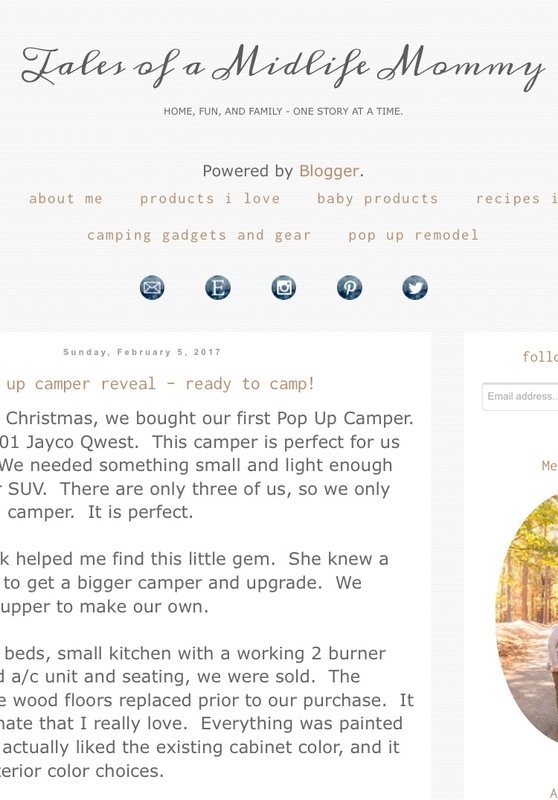 Most bloggers have a very specific market they are targeting - cooking, parenting, travel, etc. I should probably narrow down my focus a little, but it is more of a lifestyle blog. And, that is another post or really just a conversation to have in my own head. Blogger from Google is an easy way to create a blog. It has a content editor that functions like a word processor. It also has an HTML option to view and edit code. Blogger allows users to add photographs, links and even video. One of the things that is limiting about Blogger are the template options. 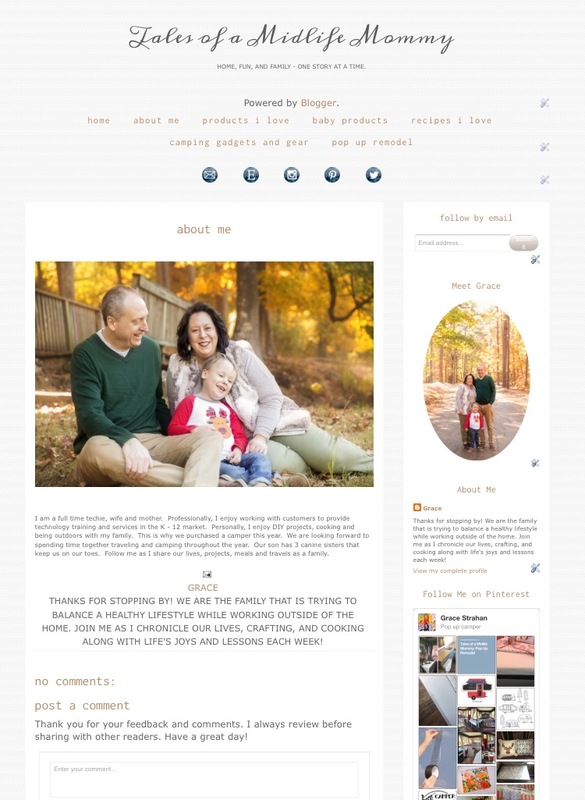 I finally decided to update my look with a free Blogger Template. While it was okay, I never could change some things that bugged me. So, I finally broke down and purchased a template from Etsy made by Sweet Theory Designs. 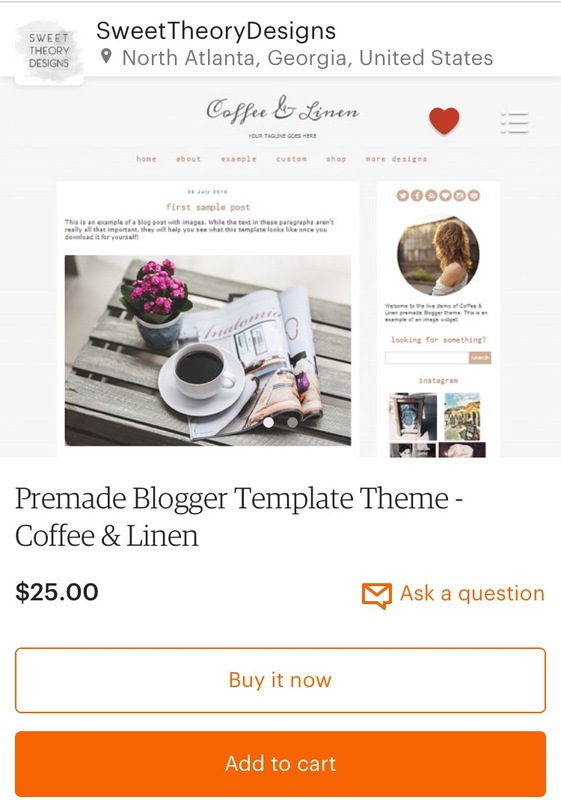 The creator on this shop make blogger templates as well as social media icons that make a blog look professional and polished. For $30, I had both. Well worth the investment. 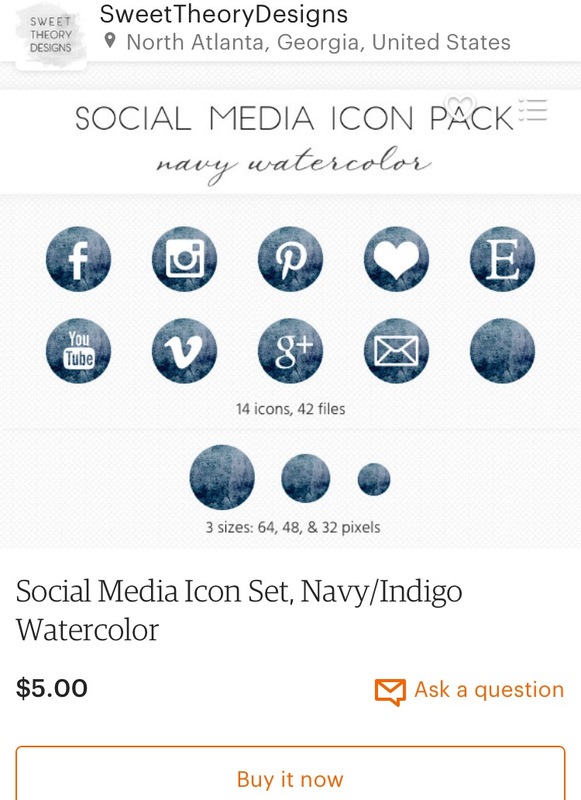 Social Media icons for purchase that easily coordinate with the Blogger Theme. Blogging Templates on Etsy are easy to find and have modern looks and many different options. A friend recently suggested that my Blog had too much of a feminine look to appeal to both men and women readers. My new theme is much more gender neutral. I'm hoping that this will grow my readers. However, if you are considering a blog and want to appeal to women readers or a very specific audience, there are options for templates can be specific to the audience you are growing. To get started with your first blog, start with an idea and a name. I would recommend purchasing your own domain name. I used the Blogger assigned name for a long time, but I feel like this doesn't grab many searches online. I purchased my domain for $12. This is a dollar a month. After you have a name and a domain, then select a template. If you are not sure about what you want to do, then use a free template for a while. But purchasing one can be very inexpensive. I purchased my theme for $25. It belongs to me, and is something that I can use until I want to change it again. Then you will want to start creating content. I typically have about 3 posts per week. Your content can be anything from product reviews, recipes you have tried to travel. It might be clothing or make you want to share about. You are in total control of your content. I would recommend pictures. This will appeal to readers and make your blog look better! If you are using a cell phone to take pictures, I would also recommending upgrading to a better camera app than the one that came with your phone. It will make a difference. 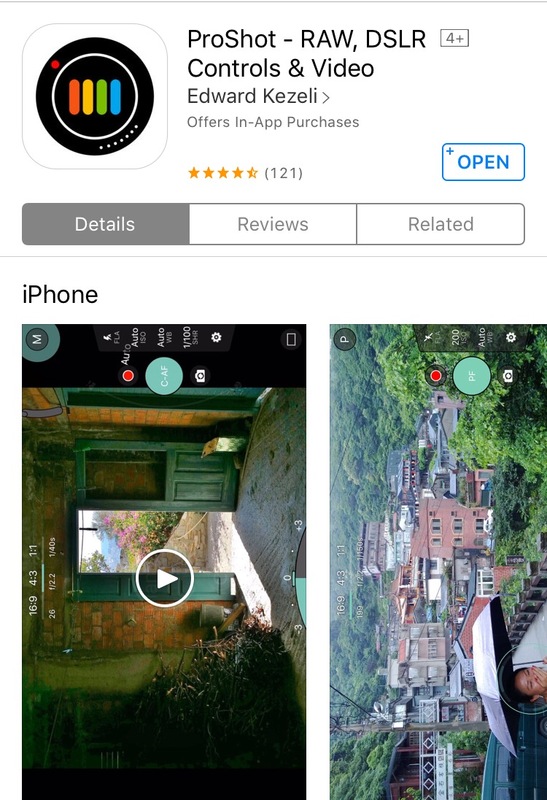 ProShot is the app that I use. Finally, share! Promote your blog posts through social media outlets. I pin my posts to Pinterest for other readers to find and read. I Tweet, Instagram and share on Facebook. It does make a difference. Hashtags are also very important. Use hashtags that are relevant to your content and will help readers to find you. 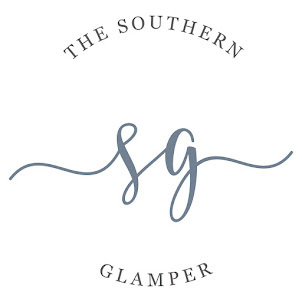 For example, with my pop up camper remodel, I used hashtags like: glamping, camping, travel, popupcamper, popupcamperremodel, popupcampermakerover, and diy to attract more readers. Using the right hashtags will automatically help to grow people viewing your content over time. A bonus depending on what you are going to be doing with your blog could be joining Amazon Affiliate or other affiliate programs. These programs provide advertising on your blog. Then, when readers click on links and purchase from your site, you make money. No, I'm not quitting my day job But it is nice to make a little here and there. I also actually promote products that I am trying and using for our Pop Up Camper and other DIY projects that I do at home. Blogging is a fun, creative outlet for me share what is going on in our lives. I really enjoy the process. Its a hobby that allows me to use my technical skills from my day job for something that is personally enjoyable. If you have questions, ideas or comments about my blog, feel free to share your thoughts. I'd love to hear them. This is very much a work in progress. I learn something new every single week and love that this process stretches my mind. Have a great week. Hope you enjoy my blog. Feel free to follow along so that you can receive a message when new posts are added. Its the easiest way not to miss a thing. Most of all, find a hobby that allows you to express yourself in something fun. And if that is blogging, share your site with me! I'd love to see what you are doing too! Podcasts are my favorite form of entertainment on the road. People that know me well have heard me reference podcasts on a regular basis. Because you can subscribe to a podcast and listen when it is convenient to you, it is a show that you listen to much like an audio book. I have seven ones that I truly love and highly recommend. This American Life is a weekly radio show that features a different theme/story each week. Ira Glass is an amazing story teller with a knack for featuring interesting stories that are informative, funny, sad and amazing. I have listened to this show and laughed out loud and sobbed in my car. Some episodes bring out sheer anger and outrage. Every week, I'm suspended in a story telling capsule while listening to the episode. Because of the broad nature of the content, it appeals to a wide audience. It is the first podcast I started listening to, and love it when repeats are played because it is such as great show! 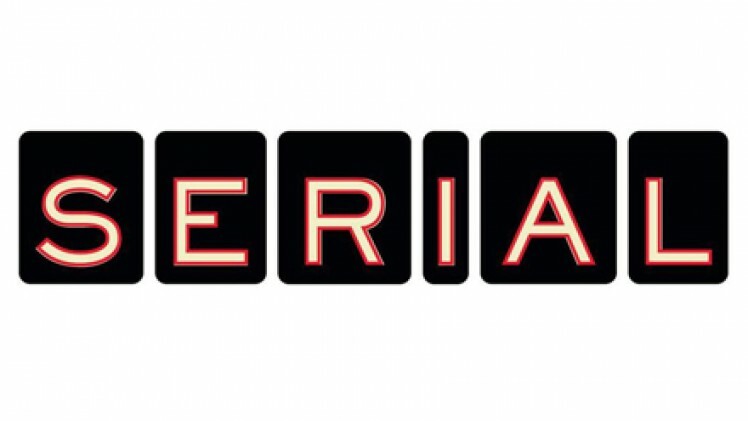 Serial is a podcast from Sarah Koenig who is also a producer on This American Life. The first season was a viral sensation. I still cannot get that season out of my head. The freshman season of Serial featured the Adnan Syed case in the murder of his girlfriend Hae Min Lee. It is a tragic story that is still ongoing as he fights for his conviction to be overturned. I was a little disappointed in the second season that followed the Bowe Bergdahl case. However, the reporting is insightful and interesting. Sara Koenig has a hypnotic voice that draws the listener in as she narrates the story. After Serial, three attorneys picked up where Serial left off and began a podcast called Undisclosed. Their first season featured the Adnan Syed Case - taking a much more granular look at the case. Rabia Chaudry had worked with Sarah Koenig from Serial to investigate this case originally. Rabia is joined by Collin Miller and Susan Simpon, also attorneys, that investigate and report. The first season was a developing season for this group. By the second season on Undisclosed, this polished group of attorneys had also polished their podcasting skills as they featured the Joey Watkins Case. It is a story about a young man serving a life sentence in Georgia. Undisclosed worked with the Georgia Innocence Project for this second season as they investigated the conviction of Joey Watkins. A third season has just started featuring a case in South Carolina. It is a show that I cannot say enough good things about. It is driven by passion for the law and exploring wrongful convictions. I highly advise going back and listening to the first two seasons, but at a minimum get in there and listen to the current season that started this week! Collin Miller, an evidence law professor at the University of South Carolina, is doing this season solo. He is a great story teller and connects modern law to literature and media in a story telling web that I truly enjoy! I'm a Law and Order junkie. Its a well known fact about me. And when someone suggested In the Dark to me, I first resisted. First, let me disclose, this is a hard listen. Very hard. It may not be for everyone. But, it is well done reporting that takes a close look at law enforcement and what went wrong in the Jacob Wetterling Case in Minnesota. There were times that I wish I had not listened, but am glad I did. I feel better informed and equipped to talk to my own son about safety. And staying in the dark about crime (no pun intended) doesn't mean it doesn't happen. It just means that sometimes we don't know enough to equip ourselves to be better protected in our communities. Recently, reporter Madeleine Baran released an updated to say that they are going to continue this series in following other stories. You can still go back and listen to the first season of In the Dark. It is great investigative reporting that is very important! Not everything I listen to is dark and related to crime. I do have a balance to my listening line up. 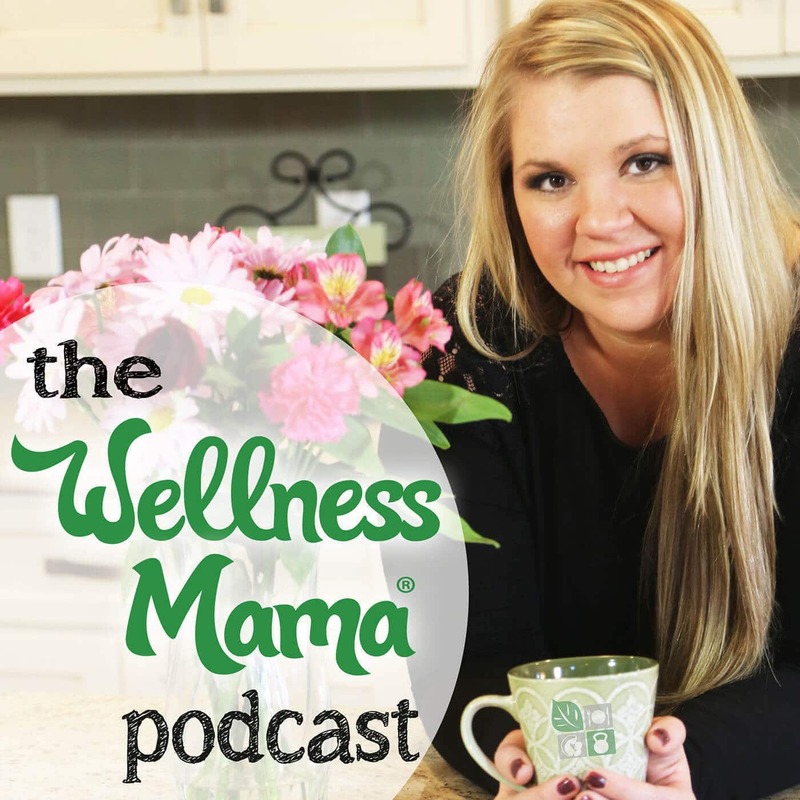 One of my new podcast in rotation is the Wellness Mama. Katie is the host and mother of 6. 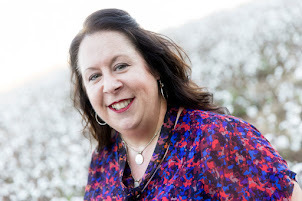 She covers topics like essential oils, sleep habits, fermentation, breaking bad habits and more. Each episode covers a different topic, and each week is something new that I am actually interested in. I feel like I've gained a lot of information from experts in many different fields. Some episodes do go on a bit long for me, but it is still a great show. If you stick in there and listen to the whole show, you will be glad you did! It is a wealth of information. She also has a great website full of resources. Finally, she has written a new cookbook with healthy recipes for families. The Wellness Mama Cookbook: Simple Recipes for Healthier Families Check it out! She really inspires me as a mother. The Splendid Table is the second pod cast that I ever listened to. Lynne Rossetto Kasper, long time host, has decided to hang her hat up this year. I am having a bit of a break up moment over this. However, Francis Lam is stepping in to fill the role as host. And he will be great. He was a featured contributor in previous years. Each week, I learn about new ingredients, cooking methods and recipes. Follow along on social media for more ideas in the kitchen. 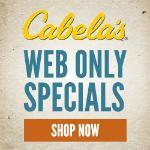 I have used quite a few recipes from this site and loved everyone. If you love to cook, this podcast is for you! This show has really increased my confidence in the kitchen to play with ingredients and try new cooking techniques in the kitchen. Wrapping up my podcast line up is the Dinner Party Download. It is a witty look at arts and leisure. It is funny and interesting. Each week, different guests share their tongue in cheek tips on etiquette, a dinner party play list and more. Hosts Brendan Francis Newnam and Ricco Gagliano won't disappoint! I've learned about movies, actors, television shows, music, food and more while listening along. It is light and a definite palate cleanser after some of my listening list! You can download and subscribe to Podcasts through your podcast app on your phone or you can listen online at many of the websites referenced above. Listen while you are running errands, on long trips or in carpool lines. It is a great way to make use of that time in the car. Or just at home instead of tv. You can thank me later! What podcasts do you listen to now? I'd love to hear about your recommendations for something interesting to listen to. Don't forget to subscribe to my blog to keep up with my adventures with my family. And be sure to hang out using my social media links at the top of the page. Have a great week! There is always one more thing to sew in my house. I don't think that I have sewn this much in years. I have probably sewn more in the past 6 weeks than I have in the past 6 years. Sewing is a great hobby and something that I really enjoy, but long projects get weary. So, I love a quick project that is start to finish in a couple of hours. As I finished our Pop Up Camper, I decided that I could not live without matching placemats for a table. Yes. You read that. I've pretty much gone all out on this project, so there is no turning back at this point! I had to some left over fabric, so it was easy to justify this project. Since placemats are essentially fabric cut into standard shapes and hemmed up, it is one of the easiest projects for a beginner. The standard size of a placemat is 12 inches by 18 inches. I made a simple pattern/template out of wax paper. I use freezer paper and newspaper a lot of make patterns for projects like this. I cut a piece of fabric for the front and the back using this pattern. I made 4 placemats. This required 4 pieces of each fabric to make the placemats. Placemats could easily be done by just sewing up and making them washable. However, I decided that I wanted to laminate the fabric with an iron on vinyl so that we could just wipe off and go. Because of this decision, I purchased a roll of Thermoweb Heat'n Bond Iron-On Vinyl -17"X5 Yards Gloss . The Thermoweb comes in a roll and was more than I needed for this one project. I'll now have left overs for some additional projects. The Thermoweb needs to be cut the same size as the front and back pieces. For this project, I cut 8 pieces of Thermoweb just like the placement front and back pieces. something underneath. And be aware that the metal of the machine would get hot! The vinyl applies to the right side of the fabric and irons on with the paper on it and removed after it has cooled. The laminated fabric looks great! After ironing on the Thermoweb, place the right sides of the front and back pieces together and pin on three sides. Sew the three sides together. Then, turn out. Before I did this, I cut the corners a little to make it easier to turn the corners. Sew three sides together with the right sides pinned. Clip the corners before turning. This was the most difficult part. The fabric is stiff on the laminated sides and wants to crinkle and wrinkle a little. Be as gentle as possible. Pin the top side inward to close the top. Sew all the way around to close the top and creating a top stitch for the other three sides. Tuck in the top and pin. Sew with a thin or narrow seam all the way around including the pinned side to close and topstitch. Start to finish, this project took less than 3 hours. This is definitely an afternoon sewing project. It feels good to actually start and finish something in a day without having my house torn up for weeks! The laminated placemats have a nice finished look and are going to be easy to care for in our camper. If I were going to make these for my home, I would skip the laminating and just make them machine washable. The Thermoweb is an easy way to make laminated baby bibs that wipe easily. Laminated fabric could also be used for making lunch bags, cosmetic bags and more. Be sure to watch for other items on my blog later this year. As I have been completing this project for my camper, I've been saving all kinds of gift ideas for this next Christmas. I have lots of fabric scraps and pieces that will make some awesome gifts. Beginning sewers should try making a simple set of placemats. This project would allow practice of making stitches, turning the fabric and topstitching. And these would make a great gift. Laminating is totally optional and not really recommended for beginners. Add a monogram either with a fabric applique or by stenciling. Both would be easy to do. Mix patterns by adding a border to either side. Select simple burlap fabric and trip with ribbon to seal the edges. This would give a rustic look and could also be stenciled with a monogram, singular word or even given a fabric applique. Be creative. Projects like this are a lot of fun because they are so simple and are very easy to dress up and add other details without a lot of work or fuss. And they aren't just for campers. Make a set for your home! If you want to see how these placemats will fit into the rest of the color scheme for my Pop Up Camper, take a look at my Pop Up Camper Reveal. I'm going to be showing off our table that we made and our dishes that go with this look soon. Have you made placemats before? If you have, what kind did you make? And, have you used iron-on vinyl before? I'd love to hear more about your craft and sewing projects. Please comment and share your experiences. If you are using my mobile site view, you may have to switch to the web-based version of my blog to make comments. But it is easy to do. Just look for the web version link below. Have a great week!